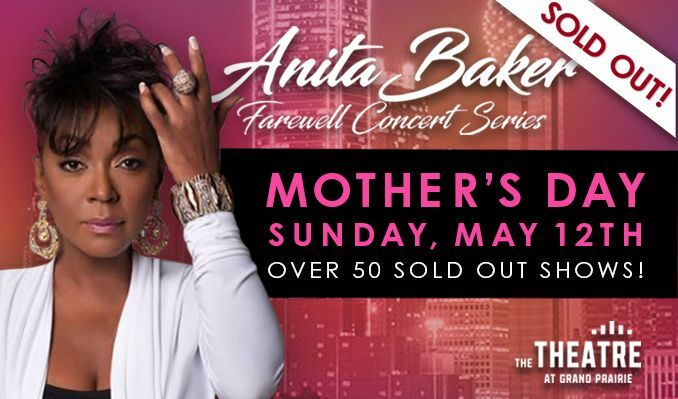 Fresh off the heels of 50+ coast to coast – standing room only - record breaking – SOLD OUT shows, eight-time Grammy Award-winning superstar Anita Baker and her Farewell Concert Series returns to Dallas at the Theatre at Grand Prairie for a Mother’s Day Weekend Celebration on Sunday, May 12, 2019! With a chart-topping catalog that touches multiple generations – concert-goers span all ages and have featured multiple special guests including Stevie Wonder, Regina Belle, Kelly Rowland, Alicia Keys, Ledisi, India Arie, BeBe Winans, Emily King and many more! You never know what surprises are in store at this truly unprecedented concert experience. Simply put – DO NOT MISS THIS magical evening that elates the thousands in its presence.